In 2018, the authorities of the occupied Crimea plan to "reconstruct" 15 objects of cultural heritage on the territory of the annexed peninsula, according to the Chairman of the so-called State Committee for the Protection of Cultural Heritage of the Republic of Crimea Sergei Yefimov. “In 2018, 15 objects of cultural heritage will be renovated and restored. Among them are the Great and Small Staircases in Kerch, the building of the former women's gymnasium in Kerch and so on,” Yefimov said. Earlier, in November 2017, the Ministry of Culture of Ukraine asked the International United Nations Educational, Scientific and Cultural Organization (UNESCO) and the International Center for the Study of the Preservation and Restoration of Cultural Property (ICCROM) to again demand that the Russian Federation terminate the destruction of the Ukrainian cultural heritage on the territory of the occupied Crimea. Also, the department demanded that the authorities of Russia immediately stop the work leading to the destruction of the Khan Palace. QHA reported that a performance action took place in Kyiv against the destruction of the Bakhchysarai Palace. 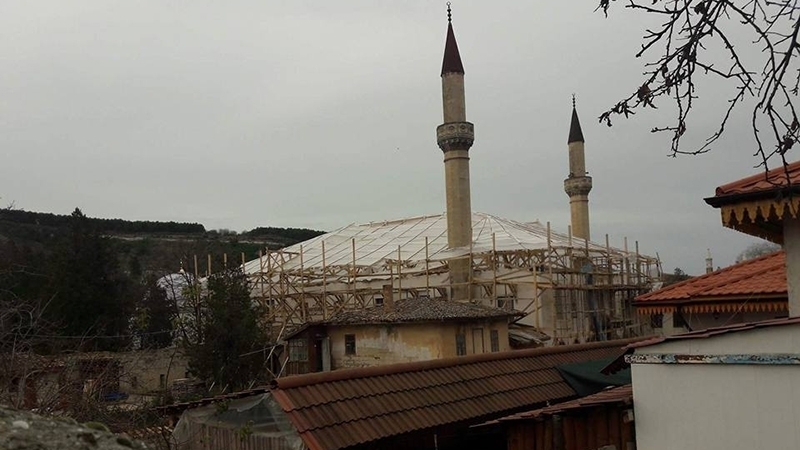 Tamila Tasheva, co-founder of the CrimeanSOS public organization, said that in the occupied Crimea, in addition to the Khan Palace, other architectural monuments and religious buildings, in particular the mosque and the Karaite kenases in Yevpatoria, are under threat of destruction.